I set this table up in our Breakfast room. The jewel colors of teal, turquoise is so rich, I wanted to add a pop of color. It is amazing how well these colors go together. I started with our rattan round chargers. I bought them years ago at Crate & Barrel. An orange charger plate goes on top. Notice the blue peacocks? I must love peacocks....LOL I find myself creating different looks with peacocks in mind. The blue dinner plates I found at Home Goods last year. They have the orange colored blossoms, so they look pretty with the peacock salad plates and bowls. I found the bright orange lanterns at Ross, along with the orange candles and turquoise candle holders. There again, I am using turquoise pillow cases on my red chairs. Orange napkins keep with the theme. What a striking convination linda, I love those dishes and the Orange napkins are absolutely GORGEOUS... Thank you for inspiring me. Your new header is so pretty too Linda! I would be delighted to sit at your vibrant table, Linda...gorgeous! Orange and aqua/teal/turquoise go so nicely together. The peacock dishes are great! VERY pretty table! Those colors are about on opposite sides of the color wheel so really go well together. Love the combo. The plates are SO pretty too! Those colors work so well together, Linda. Your peacock plates are so fun. Your trick with the pillowcases is the best! Hi Linda! Oh, I love your pretty tablescape! The blues and oranges are so pretty. So is that lantern. Oh, and look at your darling new header! I love it. Hope you're doing well and thank you for popping in to see me. Orange is not really my color. But, I love this! The colors look great together!! 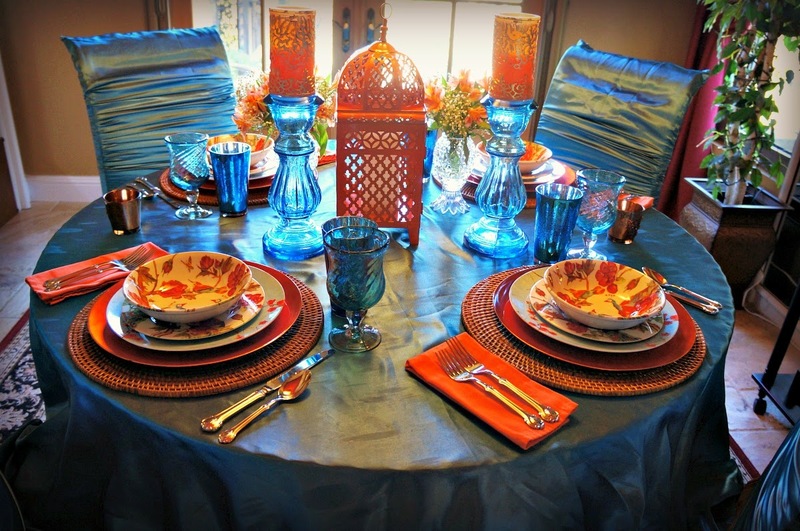 Hi Linda, I love your table setting and the colors are complimentary so they always look stunning together. Your plates are gorgeous. Every table you set and design is outstanding. You are one talented lady. So wonderful to see you back and exciting again! Love these colors Linda! 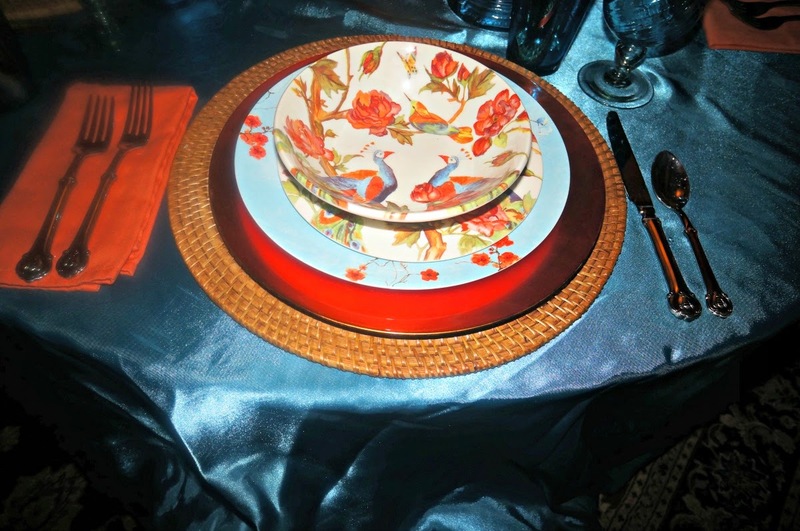 I especially like the orange blossom plates mixed with the peacock plates- great combo! I think you caught a great evening shot! It can be tricky no doubt. 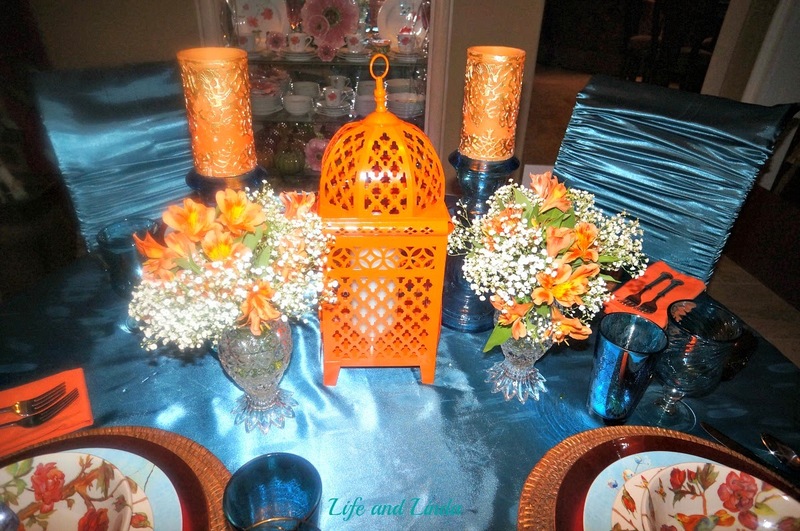 I like the lantern and the florals- sweet and colorful table! Your new header is so cute! I love your tablescape! I like the combination of all of the colors and different plates...if I lived closer, I'd certainly stop by for dinner with you! ps...I love your new Banner too! Oh wow, that is so colorful! I love the two together. I can't believe those are pillowcases!! I was wondering where you got the fabulous chair covers. What a clever idea and one that would be easy to sew too, it looks so rich to have the chair covers. The peacock plates are beautiful. 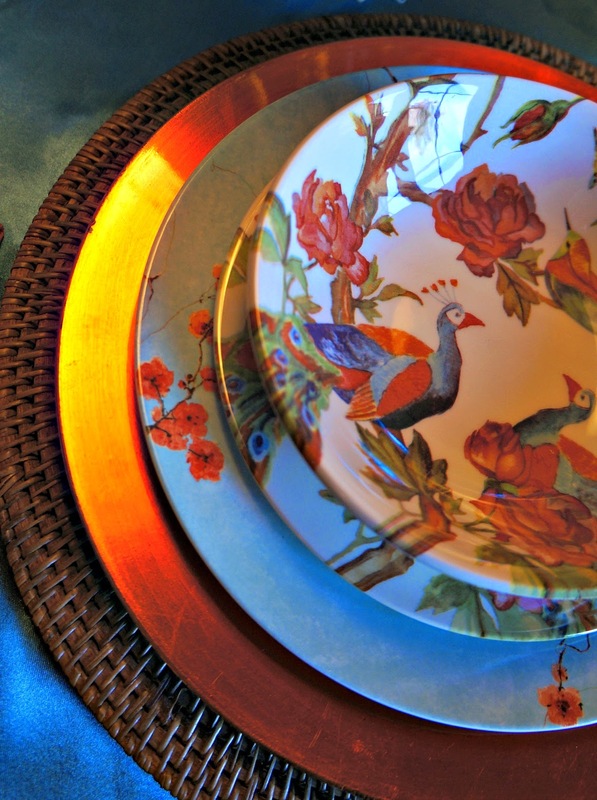 I have been tempted several times to get peacock plates. I really am overflowing with plates. I got some new things this week and now have to move things around to find a place to store them! Linda that is an amazing table setting. I don't think I would have ever come up with that! Hi Linda! Wow! That's a gorgeous table. I've never thought of using those colors. They look beautiful together and I love the blue glasses and orange candles. Lovely! 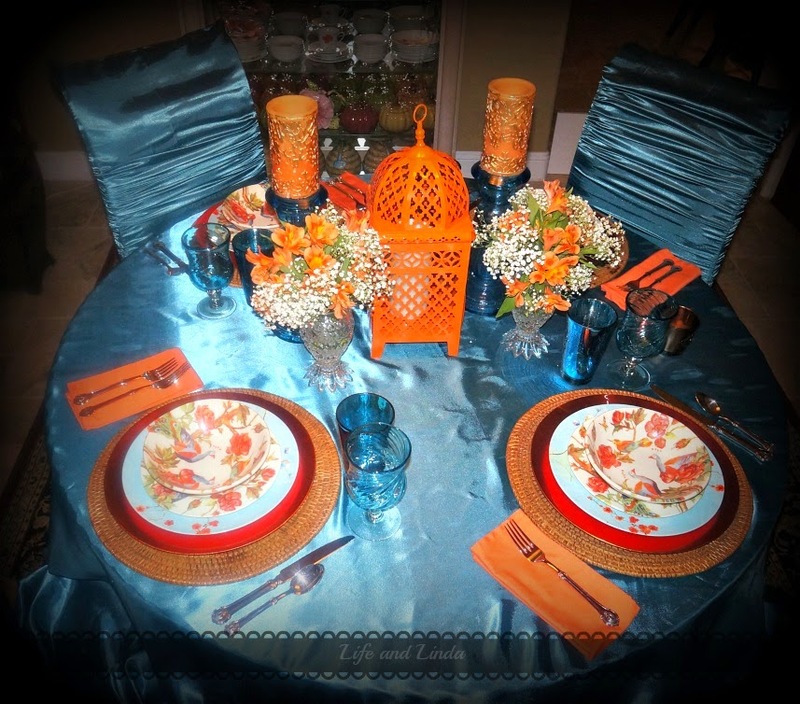 My husband's favorite color is orange so he would love a seat at your table! You always put together such lovely combinations. Good Afternoon Linda, I love your new header, it is lovely. You are so talented and you have such a wonderful eye for detail, I love your colour combinations. The peacocks on your plates are so pretty..... everything looks so beautiful. Beautiful colors on this table! Thank you for sharing at Home Sweet Home! 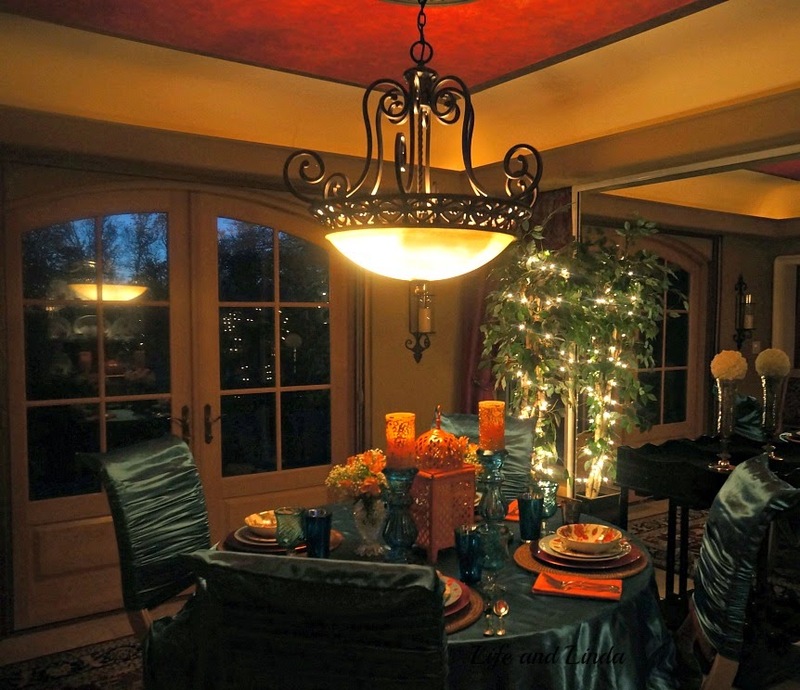 Wow Linda this is Beautiful using the two colors orange and blue together sweet ! I'am happy I came over to see you ! !